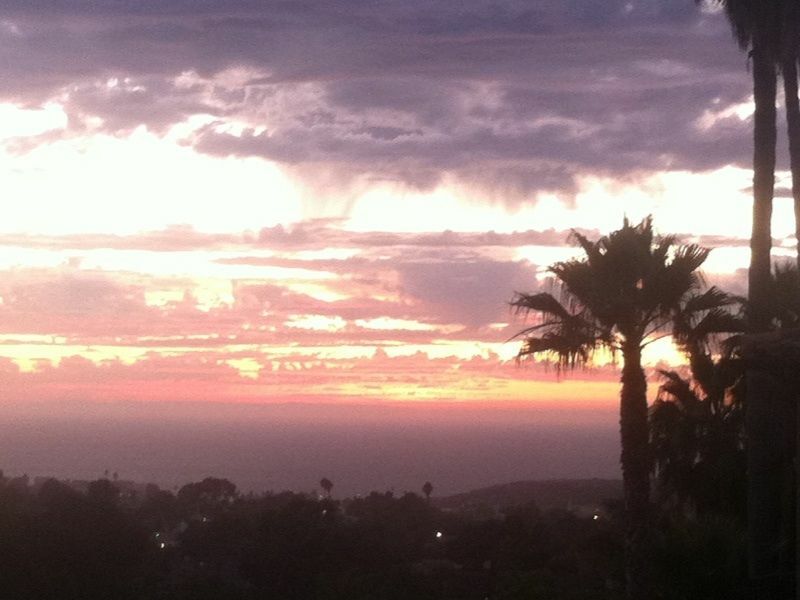 Make our paradise yours as you explore the beauty of San Clemente and its world famous beaches. Whether you choose Disneyland, Hollywood or San Diego, you will be centrally located near the 5 freeway with easy access. This Relaxing Paradise is not only spacious but has a small fenced in yard for your 4 legged friend you may bring along to vacation with you, and palm trees with beautiful ocean views . Who doesn't want to wake up looking ocean? Step outside and sip your morning coffee or come home after a long day at the beach or sightseeing and relax with a glass of wine as you view the sunset. Included in the spacious area is a comfy sofa to enjoy a 42" flat screen with multiple stations, an equipped kitchen for cooking. Close to shopping with many restaurants to choose from. Street parking, pets welcome. We bought this home because of its size, ocean and sunset views and the feel of security amongst our neighbors. Bath with single sink and a shower. Private washer/dryer in unit. Del Mar.....A great walk down the street, plenty of little shops and some great eatery's! Coffee, tea, cream, sugar, bottled H20. THERE ARE MANY STAIRS GOING TO UNIT. Family reunion? We have a second unit in same home for 6 people. This little hideaway in San Clemente was perfect for us as we visited friends in Orange County. The owners left a lot of nice amenities, like a bottle of wine, snacks and coffee. Lots of towels! The kitchen had a good supply of pots and pans, unlike other places we have stayed. There is a very nice flat TV and good internet service. Best of all was the view. There was a patio with a nice table and chairs, and a BBQ. But the best feature was an unobstructed view of the Pacific Ocean. A real find! Quaint, quiet and comfortable - lots of space for 2. Amazing ocean view. We were there over Christmas and New Years, visiting with family in north San Diego and San Juan Capistrano, so location was perfect. The unit is a downstairs apartment, and there are lots of steps outside and a few inside. Owners ensured that street parking was available at the property. Comfortable queen bed and good sized bathroom. We didn’t cook, but the kitchen was well appointed. Huge closet. Not fancy, but very comfortable, and the owners were very friendly and communicative and made sure we had everything we needed for the stay. Very nice little apartment for me and my two dogs. Great bed. Wonderful yard. Hugh backyard for dogs and visiting grandkids. Lots of nice touches by Mary Ann and Ron. (I especially liked the York mint patties). Lots of steps inside and out, so being careful is advised. We enjoyed our stay very much. Mary Anne provided a clean apartment, well stocked with everything we needed - even snacks and a bottle of wine. A good value for the price. Maryanne was sweet and accommodating. Everything worked out smoothly and we had an amazing stay! Clean, cute, charming, gorgeous views. Thank you! What kind comments. Always welcome here! San Clemente is a wonderful beach town, hidden jewel. Its one of those places you come to and fall in love with the slow pace and kick back mentality of the locals. If surfing is your thing you have Trestles close by, one of the best surf spots in the USA . Or you can just kick back and enjoy the beach, or the many little boutique shops. San Clemente offers their yearly ocean festival, street fair, as well as their yearly hot rod show both a great time and you can interact with the locals. No smoking inside, no loud noise or music, $75.00 non refundable pet fee, limit 1. Pets must have a flea collar and are not to be left unattended. In the event of a bed wetting incident, you will be responsible for the cost of a new mattress and box spring and removal of damaged set.